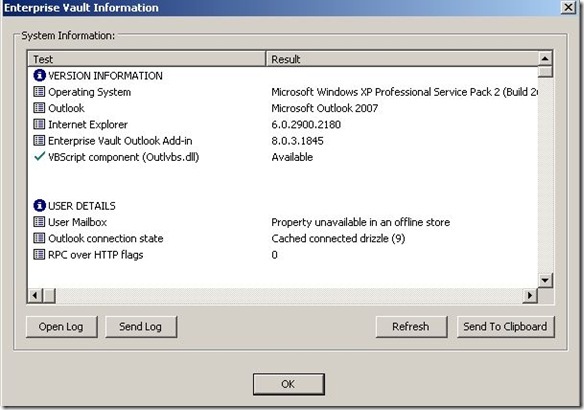 Another one of the things in the Vault Information dialog is the User Information which is available. In that screenshot we see that my user mailbox information isn’t available, because I’m not in an online mode. My Outlook Connection State is “Cached Connected Drizzle (9)” – that means I’m in cached mode (have a local OST file) that I’m connected currently, and drizzle means that I get headers followed by the full message body. Last piece of information is the RPC over HTTP flags, currently not set in my connection profile. Below you can see the difference when I switch to an Online Outlook profile. It’s unfortunate that the user mailbox is always displayed, but the information is not available to us from the OST file. You can also see below that I’ve turned RPC over HTTP on; unfortunately it’s not overly descriptive of what it shows, but it does help.